Sunday, January 17, 7:30 pm, Soiree Celebrating Seven Serenades for Scalloped Fretboard Guitar featuring Matthew Montfort (scalloped fretboard guitar, Godin Glissentar), Pena Pacha Mama, 1630 Powell near Union, San Francisco CA 94133. Tix: $12. Info: 415-646-0018. Download concert poster: 1_17_10 Pacha Mama.pdf (340 k). Full Press Release. Sunday, February 28, 2 pm, World Fusion Mini-Fest with Four Shillings Short, Matthew Montfort, Walter Strauss & Mamadou Sidibe, Don Quixote's International Music Hall, 645 Sequoia Ave., Felton, CA 95018. Tix: $10 adv./$10 door. Children 16 & under free. Info/reservations: 831-603-2294. Download concert poster: 2_28_10_don_quixotes.pdf. Facebook Event. Full Press Release. Saturday, March 6, 7 pm, Ancient Future Duet featuring Matthew Montfort (scalloped fretboard guitar, Godin Glissentar) and Mariah Parker (hammered dulcimer), In the Mood for Food Dinner Concerts, Private Location, Oakland, CA 94607. Cost: $55. Limited space. Reservations required. For info or reservations, email phil@philipgelb.com or call 510-393-6096. Facebook Event. Full Press Release. Saturday, March 27, 7 pm, Ancient Future Trio with Matthew Montfort, Mariah Parker (santur), and Joe Fajen (tabla, percussion), TimnaTal Music Presents at Village Homes Community Center, 2661 Portage Bay East, Davis, CA 95616. Tix: $12 in advance, $15 at the door. Info: 530-867-1032 or email info@timnatalmusic.com. Download concert poster: 3_27_10_timnatal.pdf. Facebook Event. Full Press Release. Thursday, April 15, 7 pm, Mariah Parker’s Indo Latin Jazz Ensemble featuring Mariah Parker (piano, santur), Paul McCandless (woodwinds, horns), Matthew Montfort (guitars), Kash Killion (bass, cello), Sameer Gupta (drums, tabla), Kuumbwa Jazz, 320-2 Cedar St., Santa Cruz, CA 95060.Tix: $12 adv, $15 door. Call 831-427-2227 or email kuumbwa@kuumbwajazz.org. Full Press Release. Monday, April 19, 8 pm, Mariah Parker’s Indo Latin Jazz Ensemble featuring Mariah Parker (piano, santur), Paul McCandless (woodwinds, horns), Matthew Montfort (guitars), Kash Killion (bass, cello), Sameer Gupta (drums, tabla), Yoshi's Jazz Club, 510 Embarcadero West, Jack London Square, Oakland, CA 94607. Back by popular demand! Mariah Parker’s debut performance at Yoshi’s August 25, 2009, had a full house on a Tuesday night in a recession! Paid Attendance: 212, plus ticket giveaways on radio! Tix: $15. Info: Call 510-238-9200 or visit yoshis.com. Full Press Release. Friday, April 23, 8 pm, Spread Your Wings & Fly with Us, A Musical Journey featuring Montana Skies, Matthew Montfort of Ancient Future, and North African music by AZA, Steynberg Gallery, 1531 Monterey Street, San Luis Obispo, CA 93401. Tix: $12 advance/$15 door. Info: 805-547-0278. Download concert poster: 4_23_10_steynberg.pdf. Facebook Event. Full Press Release. Friday, April 30, 8 pm, Spanish Serenades, Meditative Maqams, and Reflective Ragas by Matthew Montfort (scalloped fretboard guitar, glissentar), Joe Fajen (tabla, percussion) and Anya Devi (Kathak and Flamenco dance), Body Balance Studio, 151 Mill St., Grass Valley, CA 95945. Tickets: $15 at the door. Children under 10 free. Info: 530-470-0350. Download concert poster: 4_30_10_bodybalance.pdf. Facebook Event. Full Press Release. Saturday, May 22, 11 am, Ancient Future Trio presents a Child's Journey in World Music, Bay Area Discovery Museum Fort Baker, 557 McReynolds Rd., Sausalito, CA 94965. Tix: $5 members; $10 general child; $12 general adult. Price includes admission to the museum. Info: 415-339-3900. 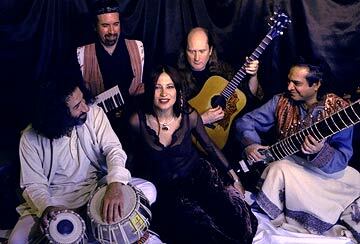 Saturday, May 29, 3 pm, Ancient Future Trio, Himalayan Fair, Live Oak Park, 1300 Shattuck Ave., North Berkeley, CA 94709. Saturday, June 5, 12 noon, Ancient Future Duet featuring Matthew Montfort (scalloped fretboard guitar) and Ferhan Qureshi (tabla), Berkeley World Music Festival, Cafe Mediterraneum, 2475 Telegraph Ave., Berkeley, CA 94704. Free admission. Saturday, June 5, 8:15 pm, Guitar Summit featuring Teja Gerken, the San Francisco Guitar Quartet, and Matthew Montfort, Noe Valley Music Series at the Noe Valley Ministry, 1021 Sanchez St., San Francisco, CA 94114. Info: 415-454-5238. Facebook Event: Facebook Event. Full Press Release. Sunday, June 13, 9:30 pm, Ancient Future Duet featuring Matthew Montfort (scalloped fretboard guitar, Godin Glissentar) and Mariah Parker (hammered dulcimer), 34th Annual San Francisco Free Folk Festival, Faith Petric Stage, Presidio Middle School, 450 30th Ave, San Francisco CA 94121. Free. Friday, June 25, 7 to 9 pm, Ancient Future Duet featuring Matthew Montfort (scalloped fretboard guitar, Godin Glissentar) and Mariah Parker (hammered dulcimer), Friday Night Concert Series at E Street Plaza, Downtown Davis, CA 95617. Free. Full Press Release. Saturday, June 26, 2 pm, Ancient Future Duet featuring Matthew Montfort (scalloped fretboard guitar) and Ferhan Qureshi (tabla), Petaluma Regional Library, 100 Fairgrounds Dr., Petaluma, CA 94952. Free. Info: 707-763-9801. Full Press Release. Wednesday, July 28, 8 pm, Ancient Future Duet featuring Matthew Montfort (scalloped fretboard guitar, Godin Glissentar) and Mariah Parker (hammered dulcimer), The Waterfront Theater, 4211 Admiralty Way, Marina Del Rey, CA 90292. Tix: $10 adv, $12 door. Doors open: 7:30. Info: 310-448 8900. Facebook Event. Download concert poster: 7_28_10_thewfr.pdf. Full Press Release. Thursday, July 29, 8 pm, Ancient Future featuring Matthew Montfort (scalloped fretboard guitar, Godin Glissentar), Mariah Parker (hammered dulcimer), and Debasish Chaudhuri, California State Summer School for the Arts, Cal Arts Campus, 24700 McBean Parkway, Valencia, CA 91355. Open to CSSSA students only. Saturday, July 31, 8 pm, Ancient Future Duet featuring Matthew Montfort (scalloped fretboard guitar, Godin Glissentar) and Mariah Parker (hammered dulcimer), The Fret House, 309 N. Citrus Ave., Covina, CA 91723. Tix: $15. $2 off if purchased a week or more in advance in person at the Fret House. Children under 12 years old half-price, under 3 years old free. $2 per order credit card service charge for tickets purchased online (www.frethouse.com) or by phone (626-339-7020). Facebook Event. Download concert poster: 7_31_10_frethouse.pdf. Full Press Release. Sunday, August 1, 7:30 pm, Ancient Future featuring Matthew Montfort (scalloped fretboard guitar, Godin Glissentar) and Mariah Parker (hammered dulcimer), Friends of Swanirvar Los Angeles Benefit, Folly Bowl, 1601 E. Loma Alta Drive, Altadena, CA 91001. Tix: $20 suggested donation. Info and reservations: 714-572-3781 or 626-797-1670. Monday, August 2, 7:30 pm, Ancient Future Duet featuring Matthew Montfort (scalloped fretboard guitar, Godin Glissentar) and Mariah Parker (hammered dulcimer), Yoga Soup, 28 Parker Way, Santa Barbara, CA 93101. Tix: $12 advance, $15 door. Info: 805 965-8811 or visit www.yogasoup.com. Facebook Event. Download concert poster: 8_2_10_yogasoup.pdf. Full Press Release. Sunday, August 15, 6 to 8 pm, 63rd Indian Independence Day Celebrations with live Indian fusion music by Ancient Future Duet featuring Matthew Montfort (scalloped fretboard guitar, Godin Glissentar) and Arshad Syed (tabla, santoor), Junnoon Restaurant, 150 University Ave., Palo Alto CA 94301. No cover for restaurant customers. Reservations recommended. Info: Call 650-329-9644, email oliver@junnoon.com, or visit www.junnoon.com. Facebook Event. Full Press Release. Wednesday, August 18, 2010, 6:30 pm and 8 pm, world music for guitar performance by Matthew Montfort with pre-show Dinner Percussion Playshop Party, Peña Pachamama, 1630 Powell near Union, San Francisco CA 94133. Tix: Guitar concert only or dinner percussion playshop party only: $12, $14 if no food is ordered. Both the guitar concert and dinner percussion playshop party: $20, $24 if no food is ordered. Peña Pachamama Special: Dinner entree, drink, dinner percussion playshop, and guitar concert: $39.95. Info: 415-646-0018 or visit http://www.penapachamama.org. Facebook Event. Download concert poster: 8_18_10_pachamama.pdf. Full Press Release. Wednesday, September 8, 9 to 11:30 p.m., Teja Gerken's Acoustic Guitar Showcase featuring Matthew Montfort (scalloped fretboard guitar, Godin Glissentar), Teja Gerken (acoustic guitars), and Alan Perlman (acoustic guitars), Sleeping Lady Cafe, 23 Broadway, Fairfax, CA 94930. No cover. Info: 415-485-1182. Facebook Event. Friday, September 10, 5 to 6 pm, Ancient Future Arabic Fusion Quartet, San Francisco Opera Guild and Opera Association Gala Celebration Cocktail Reception for the Opera Ball 2010, City Hall, 400 Van Ness Ave, San Francisco, CA 94103. Info: 415-565-3204. Wednesday, September 15, 2010, 7:30 pm, World Fusion Jam and Dinner Percussion Playshop Party, Peña Pachamama, 1630 Powell near Union, San Francisco CA 94133. Tix: $10, $12 if no food is ordered. Info: 415-646-0018 or visit www.penapachamama.org. Facebook Event. Download concert poster: 9_15_10_pachamama.pdf. Full Press Release. Thursday, September 23, 8 pm, Thingamajigs Festival featuring Matthew Montfort (scalloped fretboard guitar, Godin Glissentar), Pauchi Sasaki, Adam Fong, Gretchen Jude, NOHspace, 2840 Mariposa Street, San Francisco, CA 94110. Tix: $15 general $10 students/seniors (sliding scale). Reservations: Call 510-444-1322 or email reserve@thingamajigs.org. Saturday, September 25, 2010, 2 pm, Celtic Raga Program Featuring Matthew Montfort (scalloped fretboard guitar, Glissentar) with Ferhan Qureshi (tabla), Rincon Valley Library, 6959 Montecito Blvd., Santa Rosa, CA 95409. Free. Info: Call Anne Marie Murphy at 707-537-0162. Full Press Release. Friday, October 1, 2010, 3:30 - 6:45 pm, Ancient Future World Jazz Ensemble performance featuring Matthew Montfort (scalloped fretboard guitar), Mariah Parker (keyboard, santur), Kash Killian (bass, cello), and Ian Dogole (percussion), Sonoma County Harvest Fair, Sonoma County Fairgrounds, 1350 Bennett Valley Road, Santa Rosa, CA 95402. Adm: $6. Contact the Sonoma County Fair at 707-545-4200. Thursday, October 21, 2010, 7:30 pm, Natural Resonance Concert Series Presents Ancient Future Duet in House Concert, Natural Resonance Concert Series, House Concert @ home of Steve & Diane Leonoudakis, San Francisco CA 94117. Tix: $15 online and $20 at the door. Reservations email: Steve Leonoudakis at stepndi@gmail.com. Full Press Release. Wednesday, November 3, 2010, 7 pm, The Sonoma County Libraries Present Ancient Future In Concert Celtic Raga Program Featuring Matthew Montfort (scalloped fretboard guitar, Glissentar) with Ferhan Qureshi (tabla), Sonoma Valley Regional Library, 755 West Napa Street, Sonoma, CA 95476. Info: Call Stephan Buffy at 707-996-5217. Full Press Release. Sunday, December 12, 2010, 2 pm, Ancient Future Duet featuring Matthew Montfort (scalloped fretboard guitar) and Mariah Parker (santur), KPFA Crafts Fair, Concourse Exhibition Center, 635 8th Street at Brannan, San Francisco, CA 94103-4901. Admission: $10 general, $8 for folks over 65 years old or disabled, under 17 free. 100% of the profit from this event goes to KPFA. Thursday, January 14, 11 am, Matthew Montfort performs a live studio performance and interview on Bryan Chandler's show on KUSF, 90.3 FM, San Francisco, CA 94117. Listen to the archived show at kusf-archives.com. Monday, March 15, 5 pm, Andrea Payton interviews Matthew Montfort on 'Beyond the Invisible' on The Voice 88.7 Cable FM, streaming live online at www.accesssacramento.org, Sacramento CA 95820. Tuesday, March 16, 9:30 pm, Avotcja interviews Mariah Parker and Matthew Montfort on KPFA, 94.1 FM, streaming live online at www.kpfa.org, 1929 Martin Luther King Way, Berkeley, CA 94704. Saturday, March 20, TBA between 5 & 7 pm, Gil Medovoy interviews Matthew Montfort, KDVS, 90.3 FM, streaming live online at www.kdvs.org, Davis , CA 95616. Sunday, March 28, 12 pm, Wimmin’s Music with Laura Testa interviews Mariah Parker, KKUP, 91.5 FM, Santa Clara, CA 95050. Live on the air. No webcast. Thursday, April 1, 7 pm, WorldStreams with Dari interviews Matthew Montfort and Mariah Parker, WorldStreams.org. Streaming live and permanently archived online at WorldStreams.org. Sunday, April 4, 11 am, Ancient Future duet with Matthew Montfort (scalloped fretboard guitar) and Mariah Parker (santur), Please Stand By on KPIG, 1510 AM, streaming live online at www.kpig.com, Watsonville, CA 95076. Sunday, April 4, 2 pm, Matthew Montfort (scalloped fretboard guitar) and Mariah Parker (santur), Latin Quarter with Brett Taylor on KUSP, 88.9 FM, streaming live and archived for one week at www.kusp.org, Santa Cruz, CA 95062. Sunday, April 4, 8 pm, One World in One Hour with Lars Bourne interviews Mariah Parker, KKUP, 91.5 FM, Santa Clara, CA 95050. Live on the air. No webcast. Sunday, April 4, 10 pm, Dean Suzuki interviews Mariah Parker on KPFA, 94.1 FM, streaming live online at www.kpfa.org, 1929 Martin Luther King Way, Berkeley, CA 94704. Friday, April 9, 1 pm, Avotcja interviews Mariah Parker on La Verdad Musical, KPOO, FM 89.5, streaming live online at www.kpoo.com, San Francisco, CA 94115. Friday, April 9, 5 pm , Hala Fauzi interviews Mariah Parker, KKUP, 91.5 FM, Santa Clara, CA 95050. Live on the air. No webcast. Monday, April 12, 3:20 pm, Brad Stone interviews Mariah Parker, KSJS, 90.5 FM, streaming live at ksjs.org, San Jose, CA 95192. Tuesday, April 13, 4:20 pm , Afrikahn Jahmal Davys interviews Mariah Parker, Bajaba on Jazzline on KKUP, 91.5 FM, Santa Clara, CA 95050. Live on the air. No webcast. Saturday, April 17, 11 pm, Doug Edwards interviews Mariah Parker on KPFA, 94.1 FM, streaming live online at www.kpfa.org, 1929 Martin Luther King Way, Berkeley, CA 94704. Thursday, April 29, 5 pm, Chris Towne interviews Matthew Montfort on Thursday Music Magazine, KVMR, 89.5 FM, streaming live online at www.kvmr.org, Nevada City, CA 95959. Wednesday, May 5, 2 pm PST/5 pm EST, Karmacaffe. Live webcast interview with Mariah Parker. Saturday, June 5, 4 pm, Matthew Montfort performs live and is interviewed by JoAnn Mar on Folk Music and Beyond, KALW 91.7 FM, 500 Mansell St., San Francisco, CA 94134. Sunday, June 20, 8:30 pm, Matthew Montfort performs live and is interviewed by David Sharp on Music International, KBBF, streaming live online at www.kbbf-radio.com, 4010 Finley Avenue, Santa Rosa CA 95407. Tuesday, June 22, 2 pm, Matthew Montfort performs live and is interviewed by Marc Matheson on World Playground, KWMR, streaming live online at www.kwmr.org, 11321 State Route One #8, Point Reyes Station CA 94956. Wednesday, July 28, 6 pm, Eddie Becton interviews Ancient Future members Matthew Montfort (scalloped fretboard guitar) and Mariah Parker (santur, keyboards) on The Jazz Journey, KXLU 88.9 FM, streaming live online at www.kxlu.com, One LMU Drive, Malone 402, Los Angeles, CA 90045. Sunday, September 19, 10 pm, Dean Suzuki interviews Matthew Montfort and other Thingamajigs Festival artists on KPFA, 94.1 FM, streaming live online at www.kpfa.org, 1929 Martin Luther King Way, Berkeley, CA 94704. Thursday, October 21, 11 am, Matthew Montfort and Mariah Parker perform a live studio performance and interview on Bryan Chandler's show on KUSF, 90.3 FM, San Francisco, CA 94117. Listen to the archived show at kusf-archives.com. Due to decades of arts cutbacks, many of the presenters most supportive of world fusion music have suspended operations or are cutting their seasons. For our 32th Season, we need your help to replace lost operating income caused by diminished arts support. Donations are tax deductible. More info.